What Are Treatments for Brain Cancer? What Are Surgical Treatment Plans for Brain Cancer? What Are Side Effects of Brain Cancer Treatments? How Can People Prevent Brain Cancer? What Is the Prognosis for Brain Cancer? What Is the Life Expectancy for Someone With Brain Cancer? Cancers of the brain are the consequence of abnormal growths of cells in the brain. Brain cancers can arise from primary brain cells, the cells that form other brain components (for example, membranes, blood vessels), or from the growth of cancer cells that develop in other organs and that have spread to the brain by the bloodstream (metastatic or secondary brain cancer). Although many growths in the brain are popularly called brain tumors, not all brain tumors are cancerous. A tumor is simply a mass of cells. A benign tumor is composed of cells which are not cancerous. A malignant tumor is comprised of cancer cells. Cancer is a term reserved for malignant tumors. Malignant tumors are composed of aggressively growing, abnormal-appearing cells referred to as cancer cells. Malignant tumors grow and spread aggressively, invading and spreading into areas of healthy tissue, and then overpowering them by taking their space, blood, and nutrients. Like all cells of the body, tumor cells need blood and nutrients to survive. This is especially a problem in the brain, as the expanding mass caused by added growth within the closed confines of the skull can lead to an increase in pressure within the space inside the skull (intracranial pressure) or the distortion of areas of the brain, causing them to fail to work properly. Both malignant and benign brain tumors can cause the problem of increased intracranial pressure and its consequences. Malignant brain tumors usually cause such problems more aggressively and quickly than do benign brain tumors. Almost all tumors that begin in the brain do not spread to other parts of the body. Another major difference between benign and malignant tumors is that while malignant tumors can invade the brain tissues and grow rapidly, benign tumors usually push on, rather than invade, adjacent tissues. In general, a benign tumor (noncancerous) is less serious than a malignant tumor. However, a benign tumor can still cause many problems in the brain, but usually the problems progress at a slower rate than malignant tumors (for example, Hippel-Lindau disease may reduce both benign and ma tumors in the central nervous system). Sometimes people confuse brain aneurysms with brain tumors. Brain aneurysms are not tumors; they are areas in the brain arteries or veins that are abnormally weak and expand to form a ballooning or expansion of the vessel wall. They seldom produce any symptoms unless they begin to leak blood into the surrounding brain tissue or if they burst. Aneurysms may be congenital (present at birth) or expanded or formed in brain vessels after vessel damage (for example, trauma, atherosclerosis, high blood pressure) but are not formed from cancer cells. Unfortunately, when aneurysms produce symptoms, they can resemble those produced by brain tumors. Spinal cord tumors like chordomas and other cancers or infections in tissues adjacent to the brain may produce some symptoms like those found in primary and secondary brain tumors. The brain is made up of many different types of cells and tumors that arise from a brain cell type are termed primary brain tumors. The answer to the question "How common is a primary brain tumor?" is that this type of tumor is uncommon (about 12 per every 100,000 people per year). Cancers occur when one type of cell transforms and loses its normal characteristics. Once transformed, the cells grow and multiply in abnormal ways. As these abnormal cells grow, they become a mass of cells, or tumor. Brain tumors that result from this transformation and abnormal growth of brain cells are called primary brain tumors because they originate in the brain. Brain tumors occur in both pediatric and adult patient populations. The most common primary brain tumors are gliomas (for example, astrocytoma). Meningiomas (meningeal or meninx tumors), pituitary adenomas, craniopharyngiomas, vestibular schwannomas, primary CNS lymphomas, and primitive neuroectodermal tumors (medulloblastomas) are also primary brain tumors. The term glioma is an expansive one since it includes numerous subtypes, including astrocytomas, oligodendrogliomas, ependymomas, and choroid plexus papillomas. These primary tumors are named after the part of the brain or the type of brain cell from which they arise. Per the Central Brain Tumor Registry of the United States estimates in 2018, approximately 77,670 brain tumors will have been diagnosed in the U.S. this year. About 25,000 will have been malignant, and about 52,800 benign (with about 22,000 cases being diagnosed as meningioma, the most common form of brain tumor, and usually a benign type). About 688,096 people in the United States are currently living with a brain tumor. 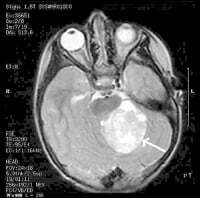 Glioma is the most common type of malignant brain tumor, with at least half being grade IV or a glioblastoma (for example, glioblastoma multiforme), the most aggressive type of malignant brain tumor or brain cancer. Terms change over time. The term oligoastrocytoma is now considered to be obsolete since new diagnostic methods have been able to distinguish cancer types that this older term represented. Metastatic brain tumors (also termed secondary brain tumors) are made of cancerous cells that spread through the bloodstream from a tumor located elsewhere in the body. The most common cancers that spread to the brain are those arising from cancers that originate in the lung, breast, and kidney as well as malignant melanoma, a skin cancer. The cells spread to the brain from another tumor in a process called metastasis. The process metastasis occurs when cancer cells leave the primary cancer tissue and enter either the lymphatic system to reach the lymph nodes and possible later the bloodstream or through the bloodstream directly. These cancer cells eventually reach the brain tissue through the bloodstream where they develop into metastatic tumors. Metastatic brain tumors are the most common type of tumor found in the brain and are much more common than primary brain tumors. Metastatic tumors are usually named after the type of tissue from which the original cancer cells arose (for example, metastatic lung or metastatic breast cancer). Brain blood flow usually determines where the metastatic cancer cells will lodge in the brain; about 85% locate in the cerebrum (the largest portion of the brain, located in the upper part of the skull cavity). Unfortunately, the majority of metastatic brain tumors spread diffusely within the brain and are found at least half the time at more than one site in the brain tissue, appearing as multiple masses on the diagnostic scan. Fifteen percent of all cancers (except for non-melanoma skin cancer, and carcinoma in situ of the cervix) will be complicated by brain metastases. The team of doctors includes neurosurgeons (surgical specialists who operate on the brain and nervous system), medical oncologists, radiation oncologists (doctors who practice radiation therapy), neurologists, and of course, a primary health care provider. A patient's team may include a dietitian, a social worker, a physical therapist, and probably other specialists. As with tumors elsewhere in the body, the exact cause of most brain tumors is unknown. The following factors have been proposed as possible risk factors for primary brain tumors, but whether these factors actually increase an individual's risk of a brain tumor is not known for sure. The symptoms are caused by the tumor pressing on or encroaching on other parts of the brain and keeping them from functioning normally. In many people, the onset of these symptoms is very gradual and may be overlooked by both the person with the brain tumor and the person's family members, even for long time periods. Occasionally, however, these symptoms appear more rapidly. In some instances, the person acts as if he or she is having a stroke. In some patients, the symptoms may be more pronounced if the cancer is located mainly in a specific brain lobe that is usually responsible for certain body functions. For example, behavioral changes may predominate in frontal-lobe cancers while difficulty with speech or movements may predominate in cancers within the parietal lobe. Sudden onset of fever, especially if the patient is receiving chemotherapy treatments. If findings of a medical history and physical examination suggest to the health care professional that a person may have a problem in the brain or brain stem, additional tests may be done. Many people will have a CT scan of the brain, especially if the person is seen emergently. This test is like an X-ray but shows more detail in three dimensions. Usually, a dye, referred to as a contrast material, is injected into the bloodstream to highlight abnormalities on the scan. People with brain cancer often have other medical problems; therefore, routine laboratory tests may be performed. These include analysis of blood, electrolytes, liver function tests, and a blood coagulation (clotting) profile. If the person has mental-status change as the main symptom, blood or urine tests may be done to rule out drug use as a cause of such symptoms. The standard way of evaluating the nature and extent of a brain tumor is an MRI scan (note that some hospitals do not have MRI scanners). This is because MRI has a higher sensitivity for detecting the presence and characteristics of a tumor. Specifically, the relationship of the tumor to the surrounding brain, the brain coverings, cerebrospinal fluid spaces, and vascular structures is assessed to come up with a provisional diagnosis of the nature of the tumor. Currently, however, many institutions that do have MRI scanners still use the CT scan as a screening test for tumors. If CT or MRI scans indicate the presence of a brain tumor, the person will be referred to brain surgery (a neurosurgeon). If one is available in the area, the person may also be referred to a specialist in radiation therapy called a radiation oncologist, and a medical oncologist if they specialize in the chemotherapeutic treatment of brain tumors (a medical or neuro-oncologist). The next step in diagnosis is confirmation that the person has cancer in the brain. A scan can be considered to be highly suspicious, or even highly likely to demonstrate a brain tumor, but confirmation requires a tissue diagnosis whenever possible. A small sample of the tumor (a biopsy) is taken to identify the type of tumor and the grade of the tumor. The most widely used technique for obtaining a biopsy is a surgical procedure called a craniotomy. The skull is opened, usually with the intention of removing the whole tumor if possible. A biopsy is then taken from the tumor. If the surgeon is unable to remove the entire tumor, a small piece of the tumor is removed. In some cases, it is possible to collect a biopsy without opening the skull. The exact location of the tumor in the brain is determined stereotactically, that is, by using CT or MRI scans while the head is held still in a frame. A small hole is then made in the skull and a needle guided through the hole to the tumor. The needle collects the biopsy and is removed. This technique is called stereotaxis, or stereotactic biopsy. This process does not treat the tumor and is generally reserved for situations in which the tumor is either inaccessible or is thought to be sensitive to radiation therapy (such as CNS lymphoma or pineal germ cell tumor) and surgery is not necessary to adequately treat the patient. The biopsy is examined under a microscope by a pathologist (a physician who specializes in diagnosing diseases by looking at cells and tissues) and usually assigned a NCI grade. Treatment for brain cancer should be individualized for each patient. Treatment plans are based on the patient's age and general health status as well as the size, location, type, and grade of the tumor. In most cases of brain cancer, surgery, radiation, and chemotherapy are the main types of treatment. Often, more than one treatment type is used. The treatment types are further described below. The patient, family, and friends will have many questions about the tumor, the treatment, how treatment will affect the person, and the person's long-term outlook (prognosis). Members of the person's health care team are the best source of this information. Don't hesitate to ask them any questions. The person's health care provider and the physician team in charge of their case should discuss details about home care with both the patient and family members. Home care usually includes supportive measures needed according to the patient's symptoms. For example, walkers may be given for those patients who have gait or minor balance problems. If a person has mental-status changes, a care plan should be directed to the patient's individual needs. For example, a caregiver may be assigned to administer the patient's daily medications. If the patient's prognosis is poor, it is appropriate to discuss options of hospice care and advance directives with the doctors. Home hospice care is a way of providing pain and symptom relief, as well as emotional and spiritual support for the patient and the family, at home rather than in the hospital. It involves a multidisciplinary approach that may include a physician or other care provider, nurses, a pharmacist, aides, a social worker, a spiritual caregiver, and counselors. Advance directives and living wills are legal documents that spell out specifically which treatments are to be given and which are to be withheld. For example, a person with advanced brain cancer may not want to be put on a ventilator (breathing machine) if he or she stops breathing. Patients have the right to make these decisions for themselves as long as they remain mentally competent. They may also wish to designate someone to make such decisions for them should they become unable to do so later. Such a document is called a durable power of attorney for health care decisions. Directives should be available to health care personnel, especially when any emergent change in the person's condition occurs, otherwise a person's care directives may not be done. Home remedies claiming cures for brain cancer can be found on the Internet; they range from taking folic acid supplements to taking antioxidants and herbal substances. There is little or no data to support these claims; people are urged to discuss these treatments, before trying them, with their doctors. The treatment protocols vary widely according to the location of the tumor, its size, grade, and type, the patient's age, and any additional medical problems that the person may have. The most widely used treatments are surgery, radiation therapy, and chemotherapy. As mentioned in some cases, more than one of these treatment types is used. The purposes of surgery are to confirm that the abnormality seen on the brain scan is indeed a tumor, to assign a grade to the tumor, and to remove the tumor. If the tumor cannot be removed completely, the surgeon will at least take a sample of the tumor to identify its type and grade. In some cases, mostly in benign tumors, the disease can be completely cured by surgical removal of the tumor. A neurosurgeon will attempt to remove the tumor when possible. Patients may undergo several treatments and procedures before surgery. They may be given a steroid drug, such as dexamethasone (Decadron), to relieve swelling. They may be treated with an anticonvulsant drug, such as levetiracetam (Keppra), phenytoin (Dilantin), or carbamazepine (Tegretol), to relieve or prevent seizures. The intent of surgery for tumors is to remove as much of the tumor as is safely possible with the minimal possible loss in brain function. The large majority of patients undergo this procedure under general anesthesia. Some surgeries are done awake or under light sedation for the purpose of mapping language function. For surgery done under general anesthesia, an endotracheal tube is placed, while for those done awake, a laryngeal mask airway (or no airway) is placed and the patient is deeply sedated. The head is appropriately positioned using a clamp system that holds the skull motionless. An image-guided navigation system is often used to help determine the precise location of the incision. The scalp is prepped, after the hair is clipped, the planned incision line is infiltrated with local anesthesia, and the scalp is then incised and pushed aside to expose the skull bone. A portion of the skull is temporarily cut away and the lining tissues of the brain are opened. If it is necessary to determine whether brain function is compromised, the patient is awakened from sedation in order to respond as mapping procedures are carried out. In either case, tumor resection is then carried out. A portion of the tumor is usually sent to a pathologist for analysis. The surgeon may also decide to place biodegradable polymer wafers that deliver chemotherapy drugs (Gliadel wafers) into the tumor cavity. Once the tumor resection is complete, the membranes surrounding the brain are closed and the skull is closed, often with the use of titanium plates and screws that help hold it rigidly in its desired position. The scalp is closed; some surgeons use drains placed under the scalp for a day or two after surgery to minimize the accumulation of blood or fluid. Stereotactic radiosurgery is a newer "knifeless" technique that destroys a brain tumor without opening the skull. CT or MRI scan is used to pinpoint the exact location of the tumor in the brain. High-energy radiation beams are trained on the tumor from different angles. The radiation destroys the tumor. Equipment used to do radiosurgery varies in its radiation source; a gamma knife uses focused gamma rays, and a linear accelerator uses photons, while heavy-charged particle radiosurgery uses a proton beam. The advantages of knifeless procedures are that they have fewer complications and the recovery time is much shorter. Disadvantages include the lack of tissue available to send to a pathologist for diagnosis and brain swelling that can occur after the radiation therapy. If there is excess cerebrospinal fluid buildup because of a blockage of fluid passageways by the tumor, a thin plastic tube called a shunt may be placed to drain the fluid. One end of the shunt is placed in the cavity where fluid collects, and the other is threaded under the skin to another part of the body. The fluid drains from the brain to a site from which the fluid can be easily eliminated. Inoperable tumors are those that are located in an inaccessible place in the brain that brain surgeons cannot reach. Alternatively, although they may be able to reach the tumor, to remove it, the surgeons may have to destroy or damage so much nearby brain tissue so that the surgery may damage the patient as much as the tumor. Inoperable tumors can be of any type or size. What makes a tumor inoperable is whether or not a surgeon is confident that they can access the tumor without disrupting other significant brain tissues such as those necessary for essential body functions (for example, speech or movement). Other tumors are deemed inoperable when they are so penetrated by blood vessels that removal of the tumor and its vascular system is likely to severely damage or cause death in the patient. The surgeon determines if a patient's brain tumor is inoperable, so it is advisable to seek a second opinion from another surgeon as another brain surgeon may consider the tumor to be "operable." Physicians sometimes use whole-brain radiation therapy (WBRT) to treat inoperable brain tumors over many weeks. Radiation therapy (also called radiotherapy) is the use of high-energy rays to kill tumor cells and stop them from growing and multiplying. Radiation therapy is sometimes used for people who cannot undergo surgery. In other cases, it is used after surgery to kill any tumor cells that may remain. Tomotherapy may be used (modulated radiation therapy aided by CT scanning). Radiation therapy is a local therapy. This means that it affects only cells in its path. It does not harm cells elsewhere in the body or even elsewhere in the brain. Radiation can be administered in either of two ways. External radiation uses a high-energy beam of radiation targeted at the tumor. The beam travels through the skin, the skull, healthy brain tissue, and other tissues to get at the tumor. The treatments are usually given five days a week for about four to six weeks. Each treatment takes only a few minutes. The gamma knife and cyber knife are two terms that describe methods that use external radiation to kill cancer cells in the brain. Internal or implant radiation uses a tiny radioactive capsule that is placed inside the tumor itself. The radiation emitted from the capsule destroys the tumor. The radioactivity of the capsule decreases a little bit each day; the amount of radioactivity of the capsule is carefully calculated to run out when the optimal dose has been given. One needs to stay in the hospital for several days while receiving this treatment. Older drugs used to treat brain cancer include BCNU and CCNU, procarbazine, and vincristine. Some are given by mouth, while others may be given into the bloodstream (IV). Two drugs, temozolomide (Temodar) and bevacizumab (Avastin), are approved for the treatment of malignant gliomas. They are more effective and have fewer adverse effects when compared with older drugs. Temozolomide has another advantage in that it is administered orally, eliminating the need for intravenous lines and hospital or clinic stays for chemotherapy. New therapies (for example, use of nanotechnology to deliver drugs to tumor cells) for cancer are being developed all the time. When a research therapy shows promise, it is studied in laboratories and improved as much as possible. It is then tested on people with cancer; these tests are called clinical trials. Clinical trials are available for virtually every kind of cancer. The advantage of clinical trials is that they offer new therapies that may be more effective than existing therapies or have fewer side effects. The disadvantage is that the therapy has not been proven to work or does not work in everyone. Many people with cancer are eligible for participation in clinical trials. To find out more, ask a health care professional. A list of clinical trials is available at the web site of the National Cancer Institute. There are many "holistic" and other treatments for brain tumors cited in Internet sites, health magazines, and other publications (for example, Transfer Factor, Cellect, Vitalzym). Most of these have no scientific data to reinforce their claims and, when visiting these sites, readers are urged to read the fine print as most say the product(s) are not intended to treat specific diseases. Patients should discuss any such substances with their doctors before buying and using these items. Some are listed by the FDA as dietary supplements and warn that they have not been proved to be effective or safe. Treatment plans try to limit or reduce side effects associated with brain cancer treatment. However, most patients will experience some side effects; some side effects can be severe. People who undergo brain cancer treatment should ask about the potential side effects and help decide if the proposed treatment(s) will be worth the benefits and what to do if side effects appear. Side effects of chemotherapy may include nausea, vomiting, hair loss, and weakness. The immune system is usually suppressed, which makes the person more susceptible to infections. Other organ systems such as the kidneys or reproductive organs may be damaged. Although these side effects usually decline as treatment ends, some may not, especially if other organ systems are damaged. Radiation therapy has side effects similar to those listed above for chemotherapy, but because some organ systems do not obtain a direct radiation dose, the side effects can be less than those of chemotherapy. However, skin damage (reddish or darkened) and skin sensitivity may occur. Hair loss can also occur, especially in areas where the radiation enters the body; some hair loss is permanent. Surgery can cause both temporary and permanent changes. Side effects such as brain swelling, damage to normal tissue, mental-status changes, muscle weakness, or changes in any brain-controlled function may occur. Although such side effects usually decline over time, some may become permanent. Patients and brain cancer team members should carefully consider side effects; often some of them can be reduced by medical treatment and may not be permanent. Brain cancer patients who are candidates for treatment should understand that without surgery, chemotherapy, or radiation therapy (or combinations of them) the prognosis or outlook for most patients is poor. Once a brain tumor is diagnosed, the patient needs to be very careful to keep all appointments with consultants and the primary health care provider. In general, people with brain cancer are at increased risk for additional medical problems and, potentially, reoccurrence or worsening of their symptoms. Survivor care plans summarizing both the treatments a patient has received and recommendations for follow-up and symptom management should be requested of the treating doctors. After treatment, patients will be returning for follow-up visits with their cancer team members. A schedule of follow-up checkups and tests will be recommended. The purpose of this follow-up is to ensure that any recurrence of cancer or any long-term effect of the treatment is identified promptly so that it can be treated right away. In general, there is no known way to prevent brain cancers. However, early diagnosis and treatment of tumors that tend to metastasize to the brain may reduce the risk of metastatic brain tumors. Avoiding or reducing contact with radiation (especially to the head) and avoiding toxic chemicals associated with the oil and rubber industry, embalming chemicals, and other environmental toxins may help prevent brain cancers. Avoiding HIV infection is also suggested. The popular press and some web sites suggest that avoiding cell phone use and using a macrobiotic diet will help avoid brain cancer. Currently, there is no good evidence for these claims. In December 2010, a large study of about 59,000 cell phone users, with use times ranging over five to 10 years, claims that no substantial change in brain cancer incidence could be found in these individuals. Investigators suggest that "high usage" of cell phones over long time periods is yet to be investigated. The National Cancer Institute in 2016 published findings from several studies that summarize findings; most do not show any relation between cell phone use and cancer. However, for those who want to minimize any radiation dose from cell phones, the reader can consult the web for a list of phones that produce the highest and lowest radiation levels. The major factor(s) that influence brain cancer survival is related to the following: the type of cancer, its location, whether it can be surgically removed or reduced, and the age and overall health status of the patient. The long-term survival rate (life expectancy greater than five years) for people with primary brain cancer varies. In cases of aggressive or high-grade brain cancers it is from less than 10% to about 32%, despite aggressive surgery, radiation, and chemotherapy treatments. Treatments do prolong survival over the short term and, perhaps more importantly, improve quality of life for some time, although this time period can vary greatly. Radiation after surgery may increase a patient's expected survival as compared to not receiving it at all. Chemotherapy can further extend life for some patients when given during and/or after radiation therapy. People who have continuing seizures which are difficult to control even with medications generally do poorly over the following six months. Despite seemingly dismal chances of long-term survival, these chances are clearly greater with treatment than without. Treatment options and best-estimated prognosis should be discussed with the patient's cancer team. Living with cancer presents many new challenges for the patient and their family and friends. Patients have many worries about how the cancer will affect them and their ability to "live a normal life," that is, to care for family and home, to hold a job, and to continue friendships and activities. Friends and family members can be very supportive. They may be hesitant to offer support until they see how the person is coping with the disease. If patients want to talk about their concerns, the patient should be encouraged to do so with their friends and family. Some people don't want to "burden" their loved ones or they prefer talking about their concerns with a more neutral professional. A social worker, counselor, or member of the clergy can be helpful if a patient wants to discuss their feelings and concerns about having cancer. The patient's oncologist should be able to recommend someone. For patients with terminal cancer, hospice may help both the patient and loved ones during this difficult time. Many people with cancer are helped profoundly by talking to other people who have cancer. Sharing concerns with others who have been through the same thing can be remarkably reassuring. Support groups of people with cancer may be available through the medical center where you are receiving your treatment. The American Cancer Society also has information about support groups all over the United States. Sagittal (side view) section through the brain of a young girl. The white arrow shows a brain tumor that involves the brainstem. Cross-section of a brain tumor in a young girl. 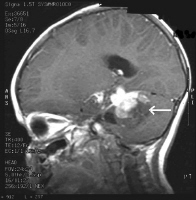 The white arrow shows the white-appearing mass (tumor). A biopsy is a sample of tissue removed by your doctor to make a precise diagnosis. Biopsy procedures can range from a simple sampling of skin under local anesthesia to surgical opening of the chest wall to remove a portion of lung tissue. Biopsies may also be obtained during diagnostic procedures such as endoscopy, colonoscopy, bronchoscopy, and others. Sometimes doctors perform biopsies using a CAT scan or other radiological imaging techniques to help identify the exact area to be sampled and avoid injury to surrounding organs. There are several types of biopsies. Beasley, K., and S. Toms. "The Molecular Pathobiology of Metastasis to the Brain; a Review." Neurosurg. Clin. North Amer. 22 Jan. 2011: 7-14. Deltour, I., C. Johansen, A. Auvien, et al. "Time Trends in Brain Tumor Incidence Rates in Denmark, Finland, Norway, and Sweden, 1974-2003." J. Nat. Cancer Inst. 101.24 (2009): 1721-1724. Huff, J. Stephen. "Brain Neoplasms." Medscape.com. Apr. 8, 2013. <http://emedicine.medscape.com/article/779664-overview>. Korley, F., J. Pham, T. Kirsch, et al. "Use of Advanced Radiology During Visits to U.S. Emergency Departments for Injury-Related Conditions, 1998-2007." JAMA 304.13 (2010): 1465-1471. United States. National Cancer Institute. "Cell Phones and Cancer Risk." May 27, 2016. <http://www.cancer.gov/about-cancer/causes-prevention/risk/radiation/cell-phones-fact-sheet>. What were the symptoms of your brain cancer? What is the prognosis for your brain cancer?